Nigeria is a nation blessed with abundant natural resources, the major one being about 35.5 billion barrels of Oil with potential for more deep offshore production and 180 trillion cubic meters of gas reserves according to the United State Energy Information Administration (EIA). This makes Nigeria the 10th petroleum rich nation according to OPEC and the most affluent in Africa. Since the late 1950s when Oil was discovered at Oloibiri, Niger Delta Region, Nigeria has extracted over $1.6 Trillion of oil revenue. Nigeria official daily crude oil production post-amnesty is 2.6 million barrels per day (excluding the stolen crude production by official and unofficial bunkerers and private oil well owners). Our daily local consumption is estimated to be 300, 000 barrels per day. This leaves approximately 2.3 Million bb/d for export to the international market to generate up to 85% of our national revenue and 95% of foreign exchange earnings. This generated revenue is a collective patrimony and sovereign wealth with politicians and policy makers as custodian of commonwealth trusted to be invested in social and developmental infrastructure for the benefit of every citizen of Nigeria and to meet our International obligations. Things like road network, hospitals and health facilities, education, housing, security of lives and properties and environment, job creations and Industries and social security support for the vulnerable citizens, these are hallmarks of a stable and responsible society. If Nigeria produces 2.6Million bpd of crude and local consumption is 0.3Million bpd, what is the need for subsidy? Why is the need to import refined fuel? How can you subsidise what is already in surplus production from the natural reserve? Can a yam farmer with large hectares of land who produces large tonnes of tubers per year for export, turn around to say he lacks pounded yam and he can only eat pounded yam if he ask his friend/competitor a tuber of yam and then pays his friend’s wife to pound it for his consumption? It betrays all sensible economic logic. Nigeria has four fully functional refineries as at 1988 built by military regimes with a total capacity of 450,000 barrels per day production. Bearing in mind that our daily local consumption is estimated at 300,000 bpd, if the refineries were to be fully or 70-80% functional, there should be no problem with fuel availability or pricing in Nigeria. We would have no business of creating a false fuel importation economy let alone fuel subsidy. Even, if we for some weird reasons decide to import refined fuel, it would be from the produced crude and there should not be any reason for subsidy because of the capacity to negotiate competitive process of production from the height of our surplus crude. This has been done successfully before in Nigeria during the military regime of Mohammadu Buhari. The concept of fuel subsidy is another word for “capital cronyism” which allows private individuals to own oil wells belonging to Nigerians, either as a front or in trust or in corrupt collusion with people in government with vast capacity and vessels to transport it out of the country and then refine it at some privately owned refineries cited in another countries or by other arrangements with refineries own and built by other sovereign nation in which they have vested interest and later secure import contracts to bring it in to sell at exorbitant unregulated prices at the pumps to innocent Nigerian citizens. The oil Sheikhs and oligarchs now receive substantial billions of naira in return from a colluding government which they now put to Nigerians as fuel subsidy! We now know that those companies and Individuals are no more faceless either by design or default, some of them have recently been named, but their backers in government remain faceless. 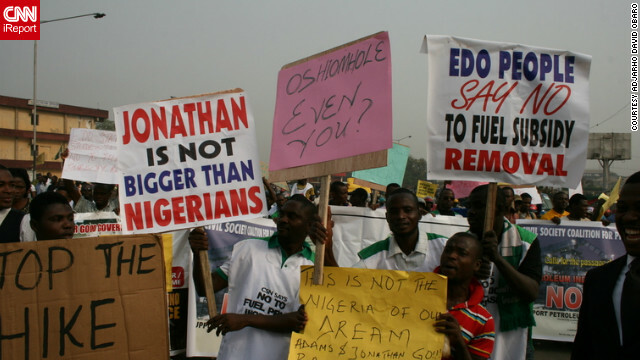 The personalities behind this so-called fuel subsidy sham are not unfamiliar to Nigerians and indeed the world. Majority of those Sheikhs exist in a cabal of government collaborators and have dine and wined publicly with different sponsors in successive government in Nigeria till date. They have been celebrated and awarded national honours, GCON, CFR, CON, OFR etc. Little wonder then why the current government of Goodluck Jonathan is claiming to be subsidizing them and their companies with about N1.3 Trillion per year, being payment for services rendered for and on behalf of themselves and sponsors in government. Removal or no removal, these cabals still retain the import licence and infrastructure to continue to import refined fuels and transport crude anyway, so the current price that the government just announced would further increase the income given to these cabals and it will also promote artificial scarcity and hoarding of imported fuel as these people also own the storage facilities for the imported fuel. The constituted government agency NNPC is effectively inert. So, the argument for subsidy removal is warped, watery, unfounded and curiously suspicious. Recently, it will refresh your memories when a General Theophilus Danjuma publicly admitted that he made a profit of $500 million when he sold off an oil well gifted to him for $1 Billion and he admittedly was ran out of ideas on what to do with the windfall in one deal! The aforementioned is typical of why Nigeria found herself in the current debacle of so called fuel subsidy. The bottom line is that there is nothing like fuel subsidy and there is in fact no subsidy on anything in Nigeria, let alone fuel! The fuel claiming to be highly subsidised is the fuel taken out of the country by the oil cabals to be refined and imported back to be sold at the pump to Nigerians. The cabals and cronies have also contributed remotely or directly to sabotaging the refineries in Nigeria to sustain their import business with dividends for their sponsors in government. It is a false economy, it is capital fraud, and it is a monumental corruption of mega proportion! It is sustained by official institutional corruption, bad governance and inept leadership till date since 1985! The current government of Goodluck Jonathan who has now announce removal of a non-existent subsidy to deceive the citizens is only interested in lining the pockets of his cronies and do the biddings shamelessly, of organisations such as IMF/World Bank to weave a cloak of poverty and hardship on the common man. They have arbitrarily and illegally increase the pump price of what we naturally have in surplus without recourse to the existing statutory constitutional and legislative framework. The accruing funds, like every other funds will fly out of Nigeria unaccounted to private accounts all over the world and go towards building estates and personal empire for them and their families in other sovereign countries like Dubai, USA, London, South Africa, Ghana and also will serve to settle down payments for privately own 5 star Hotels, Beach Resorts, in the Caribbean and choice places in Nigeria and abroad. The current Government announced a Subsidy Fund Investment Committee and other patronising lousy measures like importation of 1600 buses for Nigerians to use to ease the pain of the so called subsidy removal. Why? Will the buses run on urine or rain water? Who got the contract to import those buses and at what unit price? Again, that information is shrouded in official secrecy like every other thing, in a democratically selected government. How much will it cost to revamp our refineries to full functional capacity or even to 70-80% capacity? The government is not concern with that idea because it runs parallel to their agenda of sucking the nation dry with funds they will never need. Dead funds that does not create opportunities for educated young Nigerians or add value to the national economy. No power, no roads, universities blacklisted and on strikes, no security of lives and properties, collapsing infrastructure and housing, the list is endless. Just as they did to refineries leading to the business of fuel importation by these Sheikhs and oligarchs, the same was done systematically with our universities, industries and railways. The university situation is disheartening because they rob it on the faces of hardworking families from low-middle income backgrounds. These oligarchs and sponsors in government sends their children to universities and private schools abroad paying expensive fees and living cost at the expense of Nigerians and then ‘import’ their products (Children) back to Nigeria to continue where they left it occupying directorship positions of companies they have looted to create. The glaring bottom line is that the poor subsidise the rich in Nigeria and that is why the saying that the rich get richer and the poor get poorer is very close to the gospel truth. President Goodluck Jonathan, you have been found out! Before you seek to remove any imaginary subsidy, you should seek to remove poverty and corruption in Nigeria, and then Nigerians can see the love you have for them, not by cascading a policy that would take living costs and standards beyond the reach of the majority of the citizens. This is the NIGERIALEAK, THERE IS NO SUCH THING AS FUEL SUBSIDY, IT IS ONLY AN ECONOMIC AND FRAUD MIRAGE!